If you've played around with our Multiboot Thumbdrive image you've no doubt thought about expanding it to make it even more awesome! One of those boot images we'd like to offer prebuilt is WinFE but licensing restrictions prevent us from doing that. So we decided to go put up our tested instructions written by Kevin Stokes in our office for getting WinFE built and loaded on to the Multiboot Thumbdrive. Next week I'll be posting Kevin's write up on building WinFE Lite as well. a. Place this file in the WinBuilder file created in Step 1.
a. 32 bit is recommended for compatibility with older systems. c. Alternatively, use an ISO of the install DVD and mount it with an ISO mounter. This is my method of choice. I used Elaborate Bytes Virtual CloneDrive. Once Winbuilder is running, you will need to download the project “Win7pese.cwcodes.net”. The name could be changed, so If you’re unsure which project to get, select it, then select the main Project folder in the left pane to read the description of the project in the right pane. You may leave out some languages if you wish, English is not listed since that is the default. It is safe to leave something checked if you’re unsure of what it does. You’re just downloading at this time, not building. Once you’re sure of what to get, press the “Download” button at the bottom of the left pane. 11. We should now manually add the write protect script we downloaded to the materials WinBuilder downloaded for us. 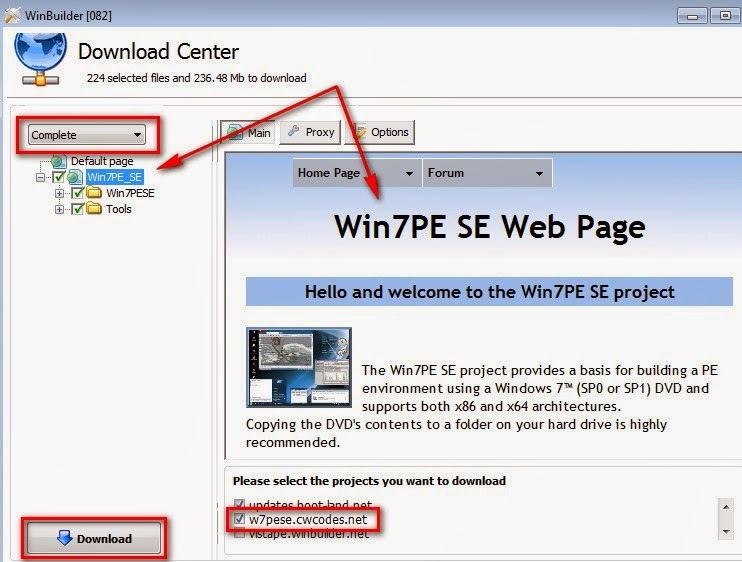 Navigate to “C:\Projects\Win7PESE\Tweaks” and add the script directly to this folder. Now close WinBuilder and re-open it. There should be an entry in the Tweaks folder for the script. It will likely be in a separate Tweaks folder, which is okay. Make sure it is checked. As it mentions, this process can be slow, as it will be reading from the DVD or DVD image. However, if you have mounted the ISO of the DVD or made a copy of the information from the DVD to the “WindowsDVD” directory as mentioned in the prerequisites, which will speed it up some. 33. If you have copied the DVD contents to “WindowDVD”, select the Sources button, then show WinBuilder where the “Source directory” is for the Windows 7 DVD folder. a. 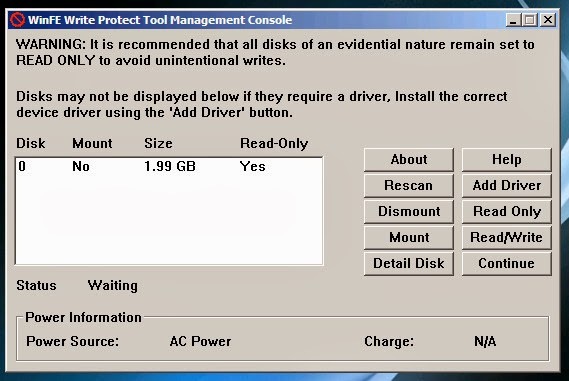 If you are mounting an ISO of the DVD, then simply point to its drive letter. 44. (Optional) In the left pane, expand the listing for “VirtualTest”. This will allow WinBuilder to open up the newly created image VMWare Player (if you installed it) to test it. Feel free to try other selections. 55. (Optional) Go through the listings and make other adjustments that you would like. Below, I made an addition to this walk-through to mention a few things I changed in my final version. Keep in mind, however, that building can be a delicate process that can take many attempts to get right. The more you add, the bigger your build and the better chance for errors. If you come across a system without much RAM, it could be bulky and slow or not run. I prefer to keep it simple and add extra utilities to another thumb drive, which can be mounted after booting into WinFE. a. WinBuilder will halt on errors. Though it does keep logs of the activity and will show you where a problem occurred. I would advise running it first with this basic build to see what it should do, then slowing adding features that you like. It would make troubleshooting much easier. 66. Now you’re ready to build! Just select the “Play” button at the top of the window. a. If you get errors, you may have to make adjustments. After you make adjustment, go to the “Main Configuration” link and select “Clean Temporary files”. This will clean out actions in the Temp folder from the previous build attempt. b. 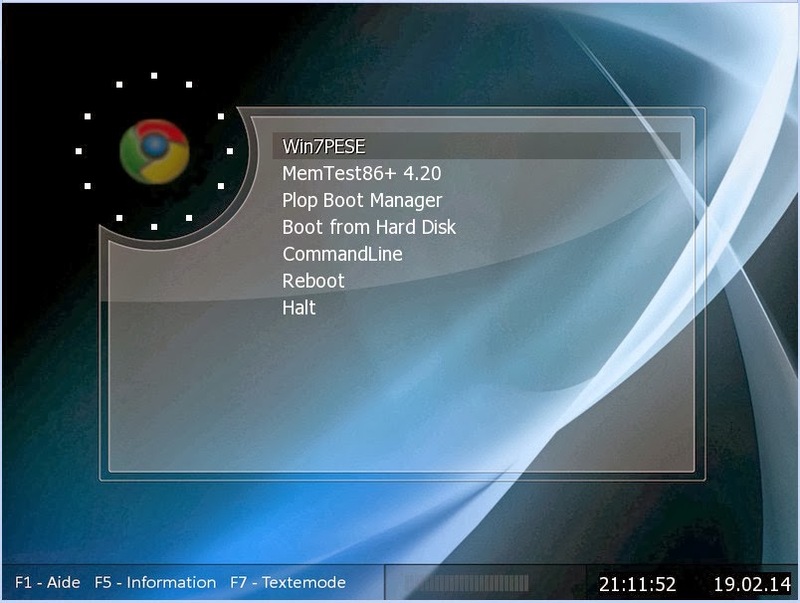 The ISO will be automatically named “Win7PE_x86.ISO”, if you followed this guide. I will rename mine to “Win7FE_x86.ISO” so I don’t confused it later on. c. Here is what the boot screen will look like. 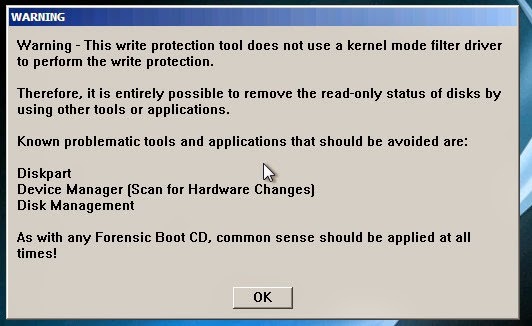 d. After loading Win7PESE, the Write Protect tool will start. e. Set up the Write Protect functions, add drivers, and get other disk information. 11. When booting there is only a 5 second timeout for the boot screen. It does boot into WinFE by default, but I prefer to control the actions at boot. I did not find a good way to manage the timer through WinBuilder, however. So, I opted to edit the boot options manually. Here is what you can do this with. d. In the File List pane, right-click “MENU.LST” and select Extract, save in a place you are familiar with. Leave WinISO running. e. In Notepad, or another editor, open MENU.LST. Delete the line “timeout 5”, or you can adjust the 5 to something longer like 20. Whatever you like. Deleting the line will disable the timer. f. Go back to WinISO, delete or rename the original MENU.LST, select “Add Files”, and add the new MENU.LST that you edited. g. Once added, select the “Save” button and confirm overwriting. h. Now you can test it in VMWare Player to make sure it is working properly. i. ** You can likely add standalone apps using this tool, but I have not done this. I prefer to keep this simple and use standalone tools in another location. 22. 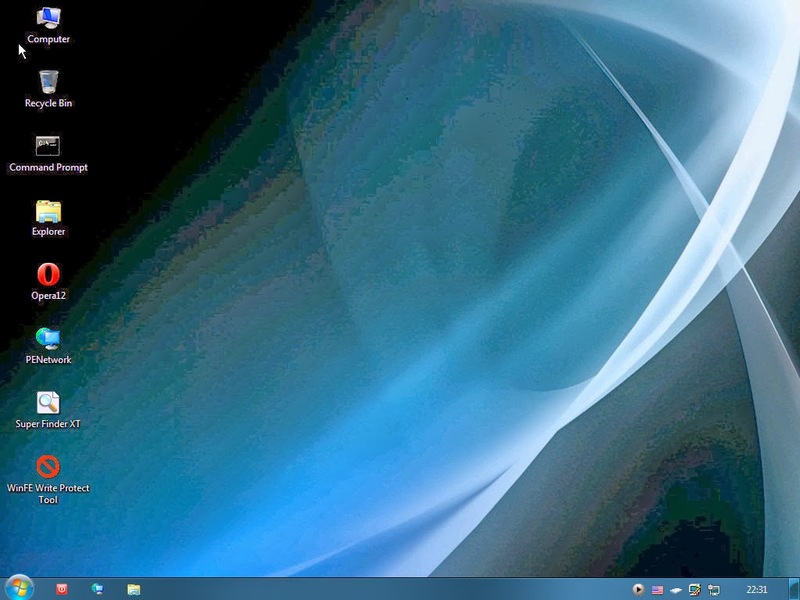 You can change the Wallpaper using WinBuilder. The script is in the Tweaks folder. 33. An IE 8 script is available in WinBuilder, in the Components folder. Though after trying this out, I opted to get the portableapps version of Firefox to run from a separate source. The final version of my WinFE image was added to a 32GB multiboot/multipartition thumb drive that I created for adding to a forensic go bag. Check out David Cowen’s Daily Blog #228 for details to download this thumb drive image and get it up and running.